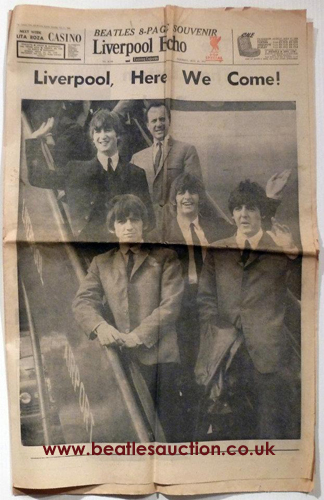 This issue of the Liverpool Echo newspaper dates from 11th July 1964, the day after the band's triumphant return to the city for the Northern Premiere of A Hard Day's Night. It features a full page photograph on the front and an eight page souvenir. This copy is in our auction in August and carries an estimate of £20-£30. The auction takes place on August 25th 2012 at The Paul McCartney Auditorium at LIPA. It is organised by The Beatles Shop on Mathew Street, where lots are still being taken in up until the beginning of June. Contact details are listed on the right of this page, and potential vendors and buyers should read the FAQs and the relevant buyers/sellers notes.